In a traditional, multi-panel graphic novel format, Darryl Cunningham is succint and direct as he refutes for the claims of science deniers, pseudoscientific theories, and claims of hoaxes. Sections cover the moon landing, homeopathy, chiropractic care, MMR vaccines, evolution, fracking, climate change, and science denial itself. 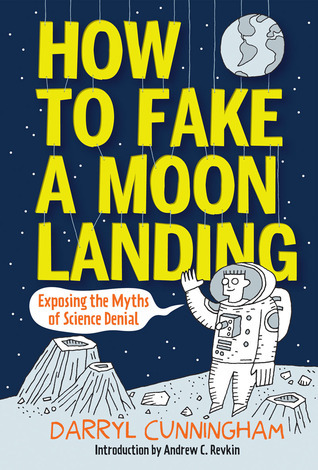 Interesting and fast-paced, How to Fake a Moon Landing pulls no punches. Cunningham takes each of the eight science denial scenarios head-on, explaining the claims of the believers and then tearing them apart. Each section includes a rich amout of history and background on the topic, as well as the “claims vs facts.” I was impressed by how much information he packed in and his ability to simply and clearly address conversations which have generated a cacophony of debate. I have booktalked this in several classrooms now. I find it good to acknowledge that the book has a high potential to offend, but even more potential to inform and to encourage further independent research on the part of the reader. How anyone ever came up with the practice of fracking is beyond me. Practically everyone – I just keep talking about it. Kids who need to read a science-based book for this year’s Summer Reading Club. Anyone interested in one of the eight topics covered. Teachers looking for an engaging, yet informative book for their classroom libraries.